Have A Wilier Triestina bike? 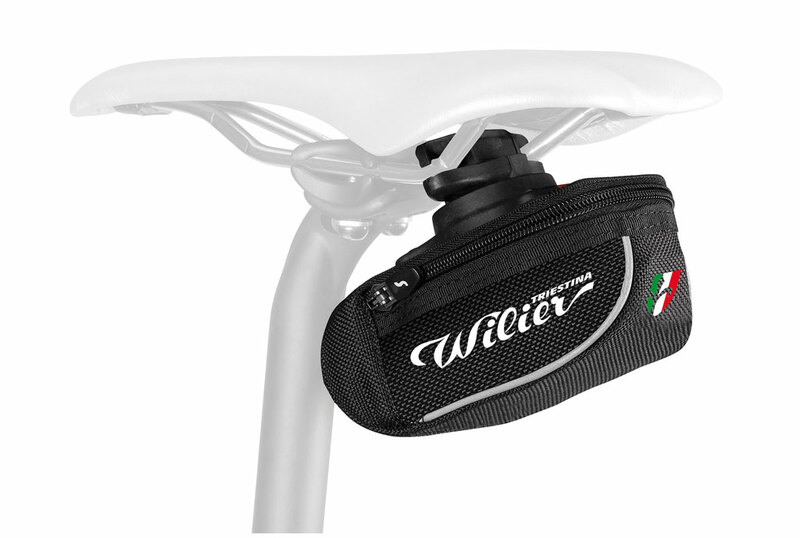 Make sure you get yourself a matching Wilier edition Scicon Compact 430 RL 2.1 Saddle Bag designed to safely store the bare essentials. The slim and subtle design hides the saddle bag neatly under the saddle which means it won’t rub against your bib shorts during your ride. The patented Roller 2.1 mounting system attaches the saddlebag to your saddle rails without any tools. In comparison to ordinary saddlebags with hook and loop fastening, the Roller 2.1 saddlebags avoid abrasion of your seat post. Built into the Roller 2.1 mounting bracket are two tire levers, complementary with every Roller 2.1 saddlebag of the range. Built into the Roller 2.1 mounting bracket are two tire levers, complementary with every Roller 2.1 saddlebag of the range. Easily accessible and great for storing real ride essentials, like one inner tube, a micro tool and a patch kit. Made out of durable woven Nylon, the Scicon Compact 430 features reflective piping for greater visibility. The Scicon Compact 430 is designed to blend in with your Wilier bike and not to hinder your ride whilst maintaining easy accessibility. Keep your pockets free from spare inner tubes and tools. Get yourself the Wilier Edition Scicon Compact 430 - a riding essential for every cyclist.